So I thought about getting a pair of protective glasses so that I could safely stare at the sun during yesterday’s Venus transit. But then it was forecast to be cloudy in the afternoon (the event didn’t start until 5pm here) so I forgot about it and figured I’d try to catch it next time around (which is 105 years from now). Sure, my priorities may have pushed the viewing to the side. But others made it their mission to see the once or twice in a lifetime event and I got to see it just for being in the same place as them. This is the meat and potatoes of Hackerspaces…. collaboration. A source of new ideas, motivations, and inspirations. 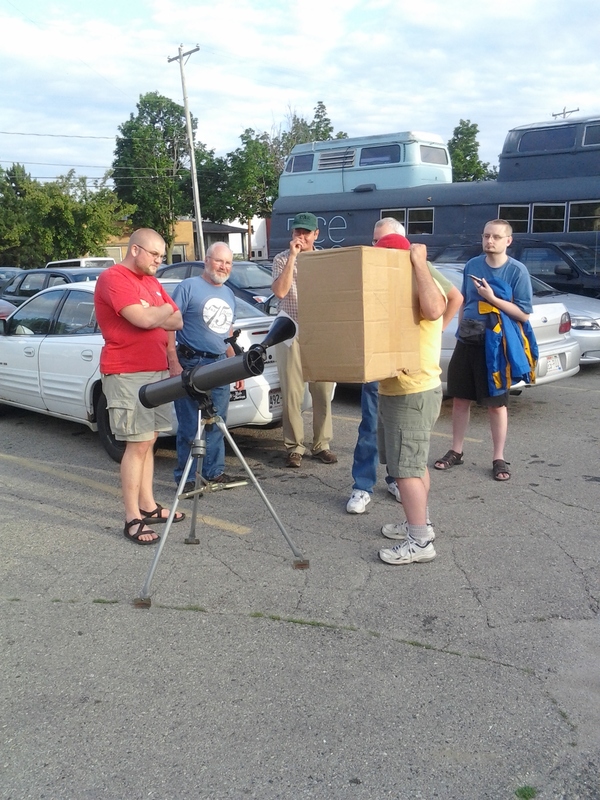 One of the members brought a telescope and went online to figure out how to safely use it for viewing. 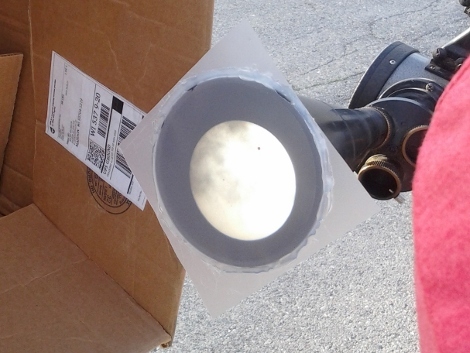 For about $2.50 he rigged up a funnel covered with a piece of acetate which interfaced with the eyepiece of the scope. The image at the top shows the entire sun, and even though some of the cloud cover can clearly be seen, there’s Venus, plain as day. The cardboard box is just providing a shaded viewing area around the funnel. As with most cosmic experiences, it surprised me by being way cooler than described. See a few extra pictures in the gallery after the break. Speaking of embedded hardware, this uses Gadgeteer modules. You probably don’t remember, but these are Microsoft’s electronic modules aimed at C# and .NET programmers. 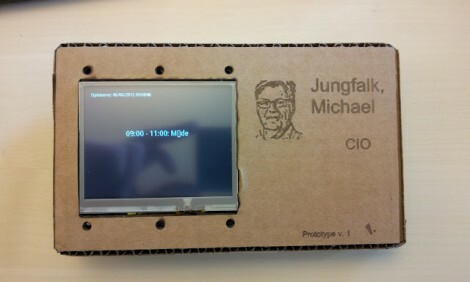 It uses the main board, and LCD, USB host, and Wifi modules. This is the first project we remember seeing since the hardware was announced. We wonder if this will change the boss’ behavior? Will he start scheduling creatively so that he gets more time without interruption? Sure, a laser-cut plywood enclosure adds a lot of maker cred, and custom plastic or cast aluminum enclosure belies an engineering and design prowess. [ardiyno] didn’t want one of these run-of-the-mill enclosures, so he made one from scratch out of limestone. The stone [ardiyno] used comes from the southern bit of his native Netherlands. 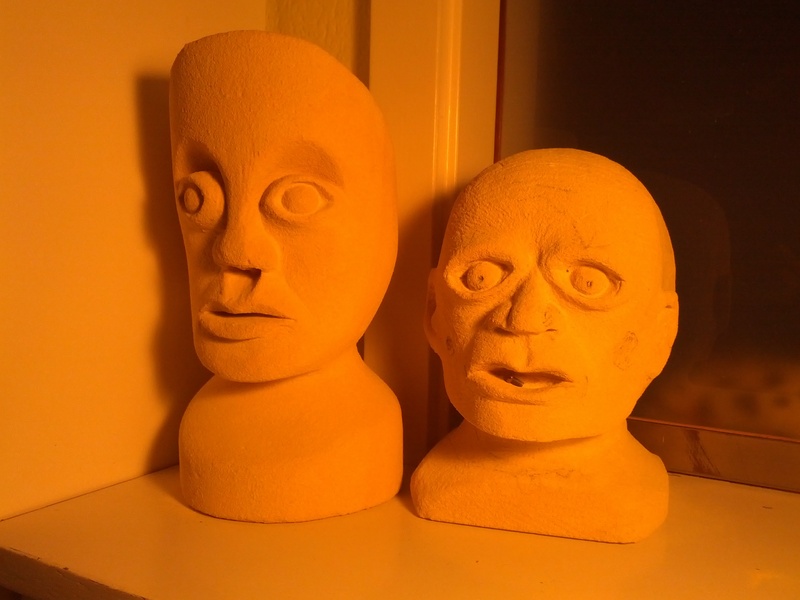 It’s a very nice limestone, easily carvable and capable of very fine detail as seen in [ardiyno]’s scary/creepy carved limestone bookends. Inside the enclosure, [ardiyno] has a calendar/clock/environmental sensor displaying the current date, time, relative humidity, and light level on twelve 14-segment displays. [ardiyno] admits the enclosure is a bit oversized for how much space his project takes up, but the extra space is meant for future internal expansions. After the break, you can check out [ardiyno]’s method of using a screw driver to carve the limestone. Normally, we’d call foul over someone abusing tools, but the limestone is so soft (the pyramids were made out of limestone using soft copper tools), there’s most likely very little damage to the screwdriver. [Rick] sent in an awesome project he and his uncle [Charlie] have been working on for this summer. It’s a completely automatic wakeboarding system that tows [Charlie] and company from one end of his backyard pond and back again. The entire system is supported by two towers at either end of the pond. Strung between these towers is a 420 foot cable that pulls the rider from one end to the other before stopping, and automatically continuing in the opposite direction. Apart from stopping and starting the motor attached to the cable, no user input is required. This means anyone lucky enough to make it to [Charlie]’s farm can wakeboard all afternoon without a break. [Rick] posted a few short videos covering the internals of the system. From what we can see, the guys are using a LabJack U3-LV data acquisition unit to grab the speed, direction, and position of the rider. This data is sent to a laptop that controls the motor suspended on one of the towers. There are a few more videos of this incredibly fun toy available after the break. Now you can find out how hard it is raining outside without leaving the confines of your mancave/womancave. 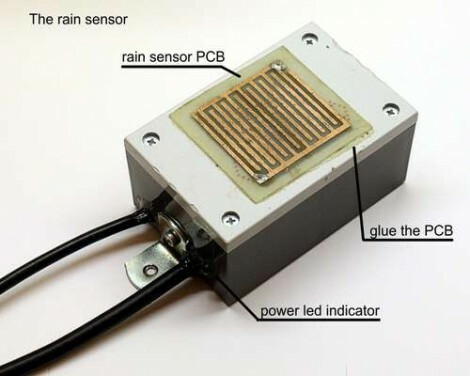 Pictured above is the sensor portion of what [Frapedia] calls his visual rain sensor. Most rain gauges just use a graduated cylinder to capture water as it falls from the sky. That will give you a reasonably accurate measure of how much it rained, but it tells you nothing about how hard it rained. The measurement made here is based on sound. The harder it rains, the lounder the sound will be from water hitting an up-turned metal bowl. The unit above turns the system on when water bridges the traces, then a microphone is used to monitor the sound from the bowl. This is visualized by a VU-meter chip on a column of LEDs mounted inside the house. After the break you can see the project box that houses the status display. We say it’s too small an needs to be replaced with a much larger LED meter. 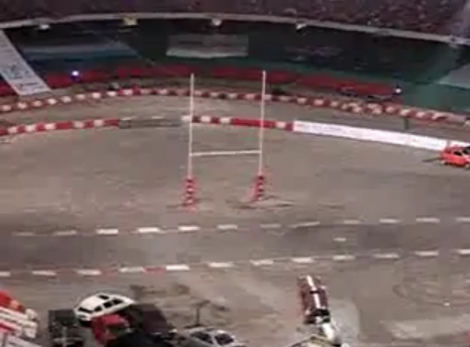 So if you had to launch a car through these goal posts how would you do it? Certainly not with a slingshot (although we might have gone with a steam-powered catapult a-la an aircraft carrier). That maroon car with the white stripe is about to make the flight thanks to a very powerful pneumatic launcher. We don’t usually attend the demolition derby, so this sort of thing is new to us. And we were even more surprised to find that this isn’t strictly a novelty act. The system is actually how some of the more dangerous automotive stunts are done for the movies. This launch sends the car in a graceful arc that is right on target and reminds us of the cliffhanger stunts from The Dukes of Hazzard (TV, not the recent movie). But if you’re a director looking for a horrific car accident, the rig can be altered to send the car spiraling through the air. Sounds like the record is nearly eight turns while airborne. We don’t have any extra cars to launch, so we’ll stick to making the confetti fly.